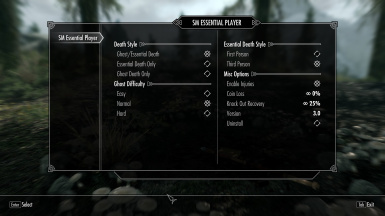 This mod allows your player to become essential like all the other unkillable NPC's. When you lose all health you will kneel on the ground then stand back up with a small amount of remaining health. Each time you become unconscious you will sustain an injury. An injury includes a number of penalties to health, magicka, fatigue, regen rates etc. Injuries will recover naturally after 5 minutes. If you are killed too soon after recovering you will die and become a ghost leaving your body and equipment on the ground. As a ghost you become invulnerable, invisible, walk silently, cannot attack, and cannot interact with the environment. After 30 seconds you can attack or interact with items to phase back into the world or wait 3 minutes. Note: If you die before collecting your items back from your old body your loot will be available at your new corpse. - To avoid most issues it now uses the first person knock out instead of third person automatically if you are transformed (no matter what is set) and the old werewolf code has been disabled. 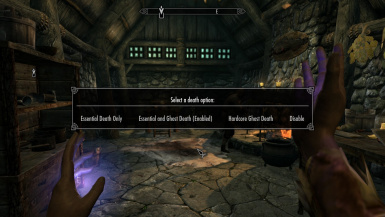 - New dawnguard esp to support the vampire transformation without breaking. - MCM support now included. - NOTE - If upgrading and you originally had coin loss option enabled you need to set it off then back on as otherwise it defaults to losing only 1% of gold. - Fix issue where you could die immediatly if you get the health injury effect.